Despite the fact that Chance The Rapper wasn’t scheduled to perform at Bonnaroo, this past weekend nonetheless proved to be a big one for him, having performed at J. Cole, Bryson Tiller, Miguel, and Macklemore’s respective sets. 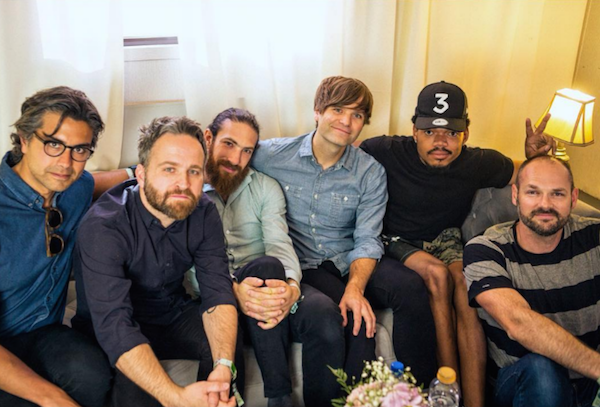 It looks like in addition to his live performances, though, Chance took the opportunity to meet up with fellow artists, including what apparently is one of Chance The Rapper’s favorite bands, Death Cab For Cutie. Death Cab’s guitarist Dave Depper documented their meeting on his Instagram, learning and later revealing that Chance is actually a “huge Death Cab fan.” It seems that the respect is mutual, too: Death Cab obliged with Chance suggested that the band try to fit 2005’s “I Will Follow You Into The Dark” into their setlist. “When Chance the Rapper wants you to play ‘I Will Follow You Into the Dark,’ well, you listen to Chance the Rapper,” Depper captioned his video of Chance adding to Death Cab’s setlist. When asked about a potentially collaboration between Chance and Death Cab, Chance responded “Big 10-4,” no doubt creating a rabbit hole of speculation. Take a look at photos from Chance The Rapper and Death Cab For Cutie’s encounter at Bonnaroo below.